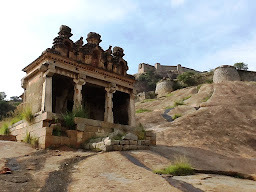 While living in Bangalore I discovered the ideal day trip - visiting one of the many hill forts around Bangalore. It's usually a 1-2 hour drive and a 1 hour climb. The scenery and the views are spectacular, and the history intriguing... Kempe Gowda, Tipu Sultan, the British. Unfortunately no efforts are spent to preserve or maintain the structures, and there often traces of looting and digging. On some, the access and trails are clearly marked, but others require a lot of searching and asking around (don't try English). Finding information on the web is often an tricky treasure hunt because spellings are all over the place. 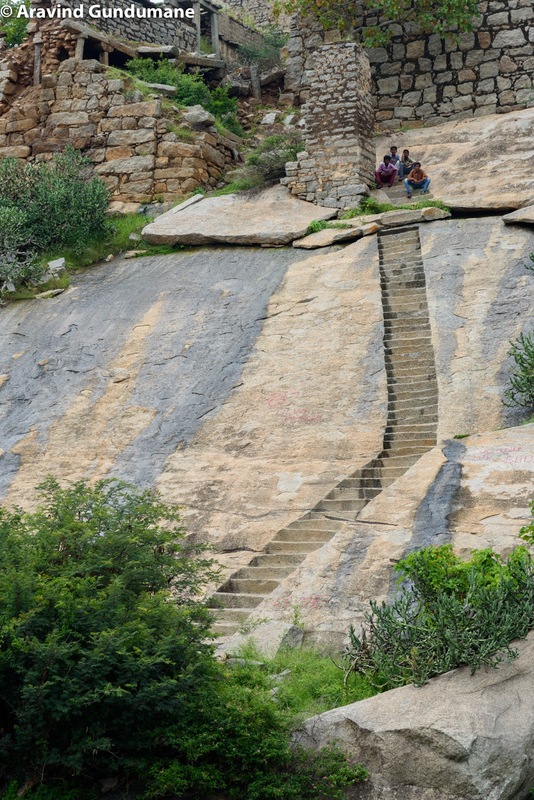 Locals wear chappals when hiking up these hills, and often take them off when walking over the rock faces. So that's the recommended footwear! Durga for beginners. Easy drive north of Bangalore, you can drive all the way up the hill and park there! The mother of all Durga's - beautiful multi-tiered fort with steep climb up and many intact structures. According to Wikipedia it's the second or third largest monolith in Asia, and the fort was constructed by the Vijaynagar dynasty. 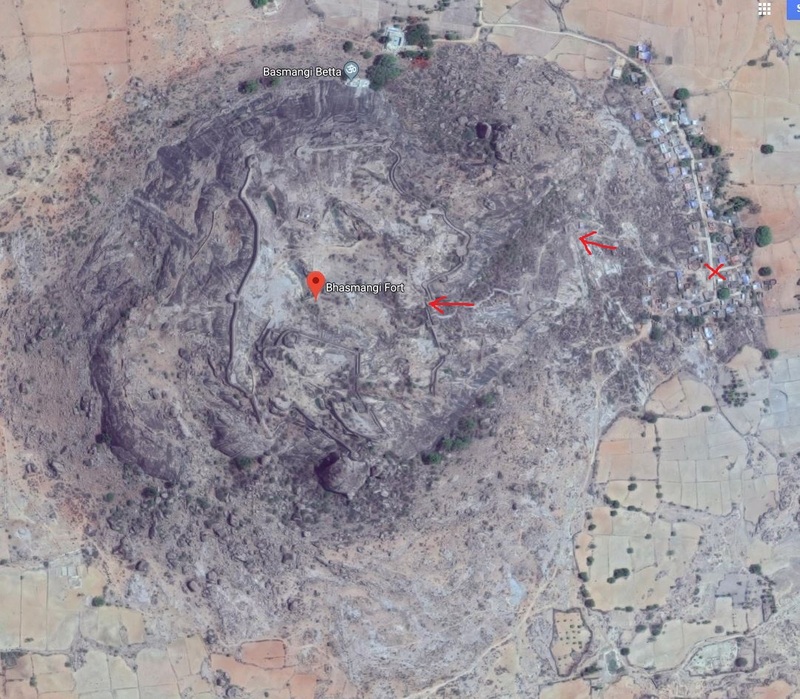 It's easy to find - drive towards Tumkur, then take Highway 3 north. You have to drive through a gate and park the car by some buildings at the bottom. The path/stairs are easy to find and follow up the hill. Fantastic fort, with nobody there. According to Wikipedia constructed by Chikkappa Gowda (also Vijaynagar dynasty). 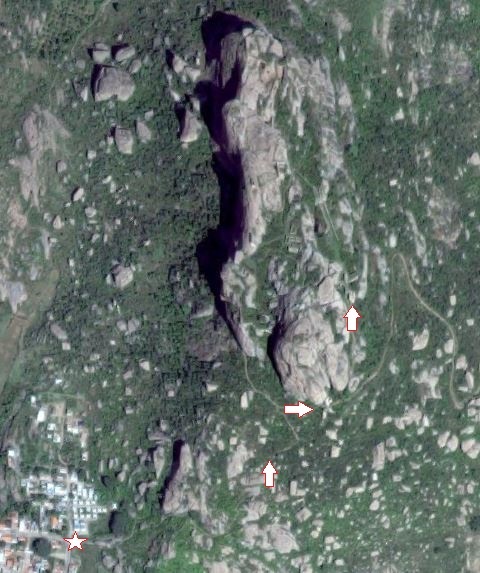 It's on the way to Madhugiri, easy to find. Park in the middle of the village, then follow one of the lanes to the bottom of the hill and walk up! Easy to find - head towards Tumkur, take highway 3 north, then follow the signs. You can drive allmost all the way up, there is a beautiful temple and then a short walk up the hill. 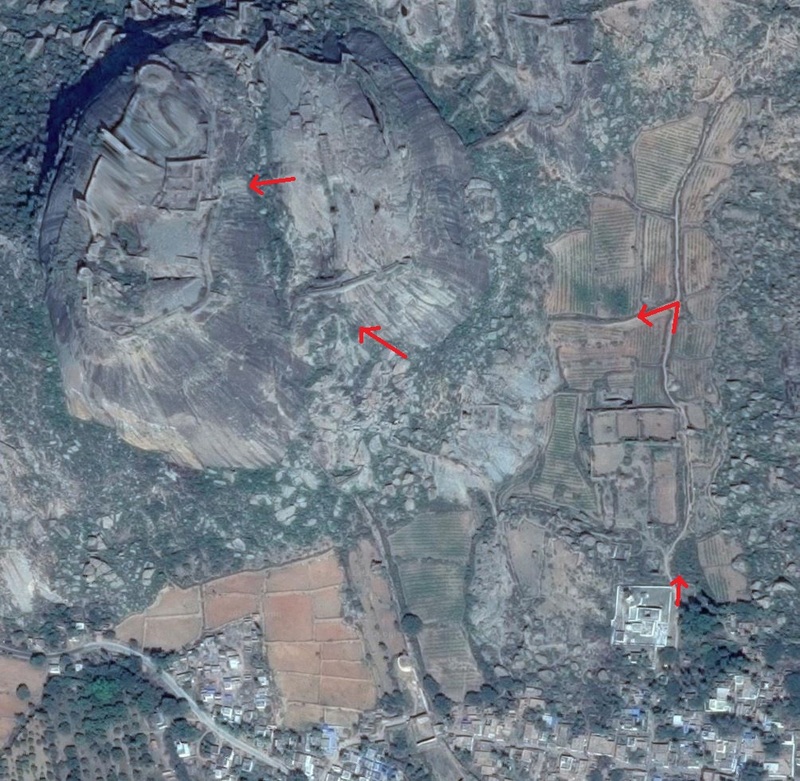 Popular destinations for Bangalorians, and very imposing rock (also one of the largests monoliths in Asia - #4 or 5). The cave scenes of "Passage to India" were apparently filmed here - did not find them though. Take Magadi road, then south on highway 3. A double fort, with structures on both sides and a village inbetween. According to Wikipedia build by Kempegowda himself! There are old prints from British times showing what it used to look like. Take Mangalore highway from Bangalore, then follow Kunigal-Magadi Road south. A huge fort that is hardly visible from below. Take Doddaballapur road (#9) from Yelahanka, then follow Green Valley Resorts road to Gundamagere Lake. You can also stay on #9, drive up to the railroad crossing and hike from there, but it's a bit longer. A beautiful fort, but difficult to climb as the path is not well marked. Take the Mangalore highway, then north on 96 towards Kudur, then take a right under an arch. A small hill, with a short climb and easy to get to. Take National Highway 7 north, the west on 94. 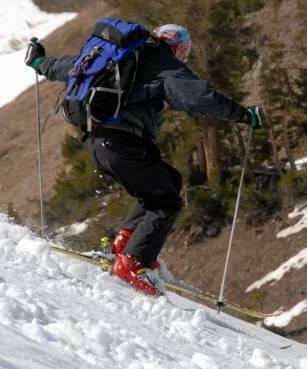 There are easy steps up the hill. Very exciting small fort, difficult to climb! Take the Mangalore highway, then by Kunigal south on 33. 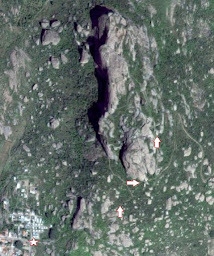 There are two hills and two forts, the smaller one is Khumbi Betta, and the large one is Yumbetta. 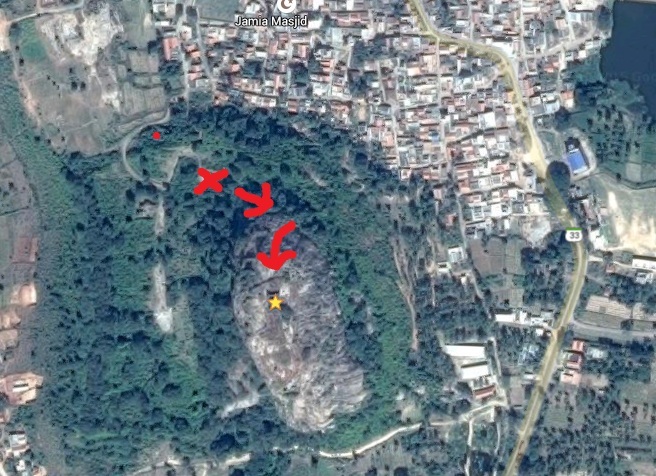 The latter has a Shiva temple on top, and easy stairs and electricity lines to follow. It is higher than Khumbi Betta, with a nice view. (Picture is of Khumbi Betta from Yumbetta. Khumbi Betta - requires some climbing, and it's not so easy to find. Get to the north side of the hill, climb some steps and get to a small temple. To the left of the temple there are are blue arrows pointing up to the first set of rocks to climb - it's just a short climb here. After that follow the path until a fork - blue arrows both ways - go left until it ends and you are at the bottom of a pretty steep rock wall. It is quite steep at first, but it has footholds (best barefoot), and after the first ten feet or so it gets less steep, and after that the path to the top is easy and includes some steps. A little farther away, in Tamil Nadu. Easy to get to and walk up. There is a gate with a lock and a guard, but if it's locked one can just slip through the fence. 20 minutes north of Madhugiri, and well worth it! Quite steep ascent over stairs, and many intact structures. 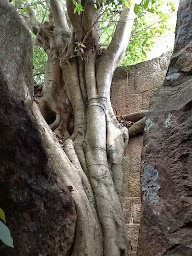 Access is behind the temple, following the visible structures (first a stone gate, then a stone shelter, then towards the fort over the rock, finally using the steps in the steep part. Also check Aravind's blog post! About 2 hours from Bangalore, down Mysore road and then south at Ramnagara to the village of Kabbalu. Quite an imposing hill from a distance! There are powerlines all the way up (lit at night? ), so it's very easy to just follow them up. Most of the climb is on steps in the mountainside, quite steep and challenging! 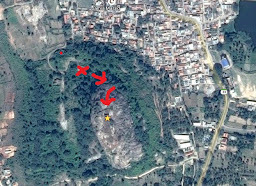 North of Bangalore, this fort was ruled by several Vijayanagar kings, but only some walls and the fort gates in the middle of town are still visible. 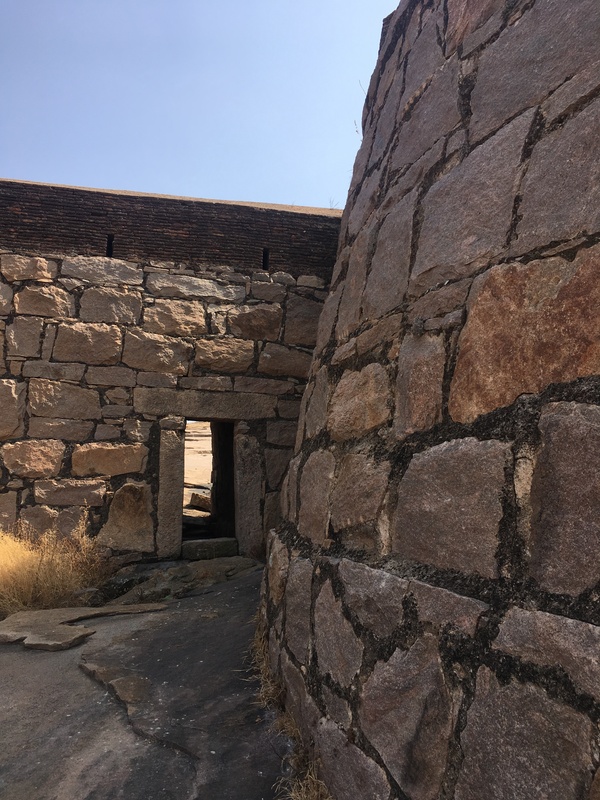 Awesome fort north of Madhugiri and Medigeshi. It sits on steep cliffs, and when approaching from the village it's inconceivable how one would ever get up. The stairs lead up to the cliffs, and then they lead through a gap to the gapside and snake up to the top. Great structure and many towers and walls etc. The approach is quite straightforward from the two tower gate in town. Check out Aravind's blog blog also. Massive fort north of Medigeshi. Interesting approach through the fort walls (part of the village is inside the walls), and then a relatively easy hike through the field and up the mountain. Check Aravind's blog for more detail! Another huge fort northeast of Madhugiri - not very high, but massive walls in good state. Start from the small village on the east side of the village to a small temple, make a donation, then follow the path behind the temple.